I love stuffed zucchini. My mom used to make them with sausage or with ground beef and they always turned out yummy. You can also make these with very large zucchini. They tend to get a bit tough during the baking process though because you need to increase the time a bit. If you are making this with large zucchini, use a casserole dish and add a little bit of broth or even water to the bottom to help soften them up. 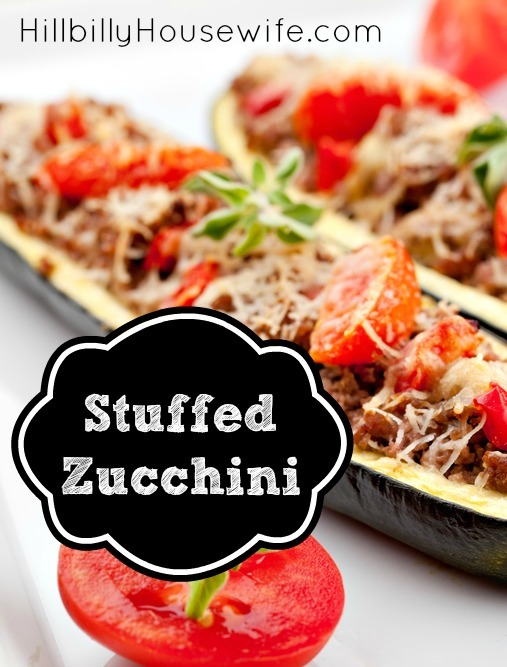 Either way this is delicious and you can use just about any melting cheese in this stuffed zucchini recipe. I’ve made it with cheddar, american , swiss, provolone, mozzarella and even blue cheese crumbles. In a pinch even a few shakes of parmesan will do. Slice zucchini in half lengthwise and scoop out the middle with a spoon. (save the inside) Brown onion and sausage and drain. Mix in the zucchini that you saved along with the basil and place the mixture back into the zucchini. Bake at 375 degrees for about 20 minutes. Remove from the oven and cover with your favorite cheese. Place back into the oven for 5 minutes to melt the cheese. * If you’re using ground beef, season it with salt and pepper to taste while it’s cooking. You can also add a little cayenne pepper for some heat.